The all-new Mercedes-Benz M-Class 2012 will be available at dealerships in September 2011 in two models: ML350 4MATIC and ML350 BlueTEC. This third generation M-Class features a bold new design, lower fuel consumption, passive safety features and performance improvement in both on-road and off-road situations. The third generation of the Mercedes-Benz M-Class sets a new benchmark in the SUV segment with its bold new design and low fuel consumption, and continues to innovate in the way it combines agility with superior comfort. 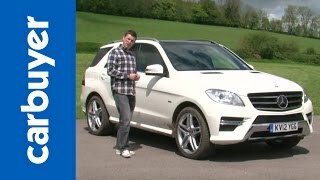 Highlights of the 2012 M-Class include 4MATIC permanent all-wheel drive, new developments to the chassis and innovative driving dynamics, all of which improve performance in both on-road and off-road situations. It features the new active and passive safety features that are now familiar for Mercedes-Benz. A characteristic body design together with a comfortable and versatile interior enhances the driving experience in the new M-Class. 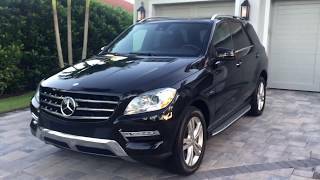 The all-new 2012MY M-Class will make its U.S. retail debut in September 2011 and includes two models: ML350 4MATIC and ML350 BlueTEC. Dr. Thomas Weber, Member of the Board of Management of Daimler AG for Group Research and Mercedes-Benz Cars development, commented: "The M-Class embodies all the automotive experience that we have accumulated over 125 years and thus represents – in short – a quantum leap in terms of efficiency, safety, agility and design!" State-of-the-art engines and a comprehensive range of fuel efficiency measures all contribute to delivering superb energy efficiency. BlueTEC diesel engines and the new generation of BlueDIRECT gasoline engines provide the starting point for the excellent efficiency of the new M-Class. 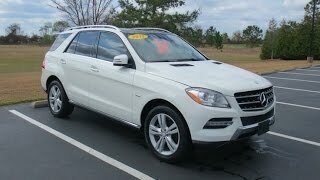 The ML350 BlueTEC uses a completely reworked 3.0-liter V6 engine, which meets emissions standards in all 50 states and delivers far better performance, yet with considerably reduced fuel consumption. The efficiency improvements have been achieved, above all, through the use of the innovative TWAS (twinwire- arc spraying) technology – in use since 2005 in AMG's successful highperformance engines. The positive results at AMG have led Mercedes-Benz to adapt this cylinder wall coating technology for use in the V6 diesel engine as well. The process reduces internal friction in the engine significantly. At the same time, the weight has been reduced by 9.5 lbs., as there is no longer any need for the grey cast iron cylinder liners that, until now, had to be pressed into the engine block. The benefits are striking: with these measures alone, fuel consumption could be reduced by around 3 percent. The excellent fuel economy is supported by a comprehensive package of BlueEFFICIENCY measures as well as by this state-of-the-art engineering. These measures include the new seven-speed automatic transmission with a more fuel-efficient torque converter, friction optimized bearings and a transmission oil thermal management system. Low-friction axle drives and electromechanical steering also contribute in reducing fuel consumption. The optimized belt drive system with decoupler, together with on-demand control of all auxiliary components and pumps, also help to reduce the energy requirements of the 2012 M-Class. The oil and water pumps in the engine, as well as the fuel pump in the rear of the vehicle, are only activated according to actual need. The same control logic is used in the air conditioning systems. In these, the coolant compressor only runs when necessary. A key factor in the diesel engines is also the optimization of the flow and backpressure in the exhaust system with its SCR (Selective Catalytic Reduction) emission control technology. A consistent use of lightweight construction techniques has enabled the development engineers to keep the weight of the M-Class on a par with that of its predecessor, despite more equipment. The hood and fenders, for example, are made out of light and yet very strong aluminum alloys, while the cross member for the instrument panel is made of magnesium. Detailed analysis: the "energy-transparent vehicle"
The "energy-transparent vehicle" development tool, created in-house by Mercedes-Benz, was used for the first time as part of the 2012 M-Class development process. The pioneering opportunities presented by this method, which detects optimization possibilities right down to even the most minute component, will be exploited on all new models in the future. An exact and meticulous examination of the flow of energy throughout the vehicle (tank-towheel) helps the development engineers to optimize every single assembly that has an impact on fuel consumption, right down to individual wheel bearings. A high level of comfort, aggressive on- and off-road handling are part of the standard equipment on the new M-Class. For the first time, the steel suspension of the M-Class chassis now includes AGILITY CONTROL adaptive damping. During normal driving on only moderately uneven roads or during slow off-road driving, the system responds with a soft ride that enhances the occupants' comfort as well as the car's off-road capability. In order to maintain this sense of comfort during hard driving or abrupt evasive maneuvers, the shock absorbers become firmer, ensuring a high level of driving stability. The M-Class driver is supported by an electromechanical steering system that provides the optimum level of power assistance to suit the particular driving condition. Parking or maneuvering off-road is made easier thanks to maximum power assistance. The SUV also features the tightest turning circle in its market segment, with a 180-degree turn negotiated within a circle diameter of just 38.7 feet. At higher speeds, the power assistance is reduced to improve SUV's handling. For those who want to venture off paved roads, the ML350 BlueTEC 4MATIC and ML350 4MATIC feature comprehensive traction systems as part of their standard equipment, including the permanent 4MATIC all-wheel drive system and the electronic traction control system ETS, as well as an off-road button that activates a special off-road transmission mode. Hill Start Assist and the HOLD function are further features that help the driver pull away on a slope. Downhill Speed Regulation, or DSR, enables the M-Class to automatically maintain the speed set via the cruise control lever. The ON&OFFROAD package for the new M-Class (available next year in the U.S.) uses a range of six transmission modes to optimize driving dynamics and handling safety, by ensuring that the necessary drive control is available to cope with the very different driving conditions on and off-road. One automatic mode, two dedicated off-road modes and three on-road modes are available. Despite so many options, the setting is made intuitively, and the program selected is shown in the multifunction display as well as in very realistic, almost photo-quality imagery on the screen of the COMAND system. Irrespective of which underlying program is set, the gear reduction, lock, DSR or the self-leveling suspension of the AIRMATIC system can all be adjusted individually. As with the basic settings of the ON&OFFROAD package, it is practically impossible for the driver to make mistakes. Conflicting settings, which might have a negative impact on handling, safety or traction, are ruled out. If there is any doubt, the system will revert to automatic mode. In terms of "hardware", the ON&OFFROAD package consists of a skid plate, a two-stage transfer case with reduction gear, a longitudinal differential (lowrange) lock and enhanced AIRMATIC functionality that allows a maximum ground clearance of 11.2 inches and a fording depth of 23.6 inches. The optional Dynamic Handling Package features active roll stabilization using the new ACTIVE CURVE SYSTEM combined with AIRMATIC air suspension, Adaptive Damping System (ADS) and 20-inch 5-spoke alloy wheels. This option uses active anti-roll bars on the front and rear axles, which it controls automatically irrespective of lateral acceleration, speed or the switch setting of the ADS Comfort/Sport switch. ACTIVE CURVE SYSTEM compensates for the roll angle of the body through turns, delivering significant improvement in both agility and driving pleasure. At the same time the system increases driving stability and thus safety, especially at high speeds. Improved ride comfort both on winding stretches of road and on straight highways, together with enhanced options for off-road driving, are also among the benefits of the ACTIVE CURVE SYSTEM. The 2012 M-Class promises relaxed and safe driving in all possible conditions. By paying close attention to detail every step of the way, the development engineers in the Mercedes Technology Center have significantly improved what they call the NVH (Noise, Vibration, Harshness) comfort level. This is an important factor contributing to the general sense of comfort on board, while also playing its part in driver-fitness safety, especially on long journeys. The basis for the high level of NVH comfort is provided by the very rigid bodyshell of the M-Class. Further improvements have also been made to the drive system and chassis. This is all topped off by aero-acoustic refinements and the intelligent use of new insulation. Intelligent use of acoustic insulation: In the production plants, insulation is fitted to the bodyshell where it is needed by computer-controlled robots. In the firewall area, the mass distribution of the insulation material used may vary in places in order to counteract potential noise penetration. In line with the Mercedes-Benz brand philosophy, the new M-Class represents the embodiment of the Mercedes-Benz holistic safety concept of REAL LIFE SAFETY, which is derived primarily from what happens in real accident situations. The extremely robust occupant compartment of the M-Class, together with the front and rear deformation zones, forms an effective basis for the occupant protection systems. The front end structure, with its high energy-absorption potential, is essentially made up of the firewall and two lines of longitudinal members, anchored at the A-pillars. Two vertical members link the longitudinal members, which further increase deformation resistance. The necessary rigidity and strength of the floor assembly is provided by a robust structure made up of a separate center tunnel plus separate longitudinal members along each side, attached to the side wall. These are supported by cross members anchored to the floor as well as by a connecting member to the B-pillar as support for the front structure. The extremely robust side wall assembly comprises, quite apart from the longitudinal members described above and the side roof frame, A-pillars in a dual-casing design, internally reinforced with high strength steel. In a side collision, the cross member beneath the cowl, the cross member between the longitudinal members underneath the pedal floor, the high-strength-steel cross member beneath the driver's seat and the magnesium-alloy cross member underneath the instrument panel, as well as the front roof frame, ensure the highest possible stability of the occupant cell. The positioning of the fuel tank in front of the rear axle and of the filler neck over the rear axle increases the available deformation distance, maximizing the level of energy absorption in the event of a rear-end collision. This is achieved, above all, through the boxshaped design of the rear longitudinal members. Weight recognition system with deactivation of the front passenger airbag if a special Mercedes-Benz child seat is used. Complementing the active safety systems such as the standard Brake Assist (BAS) or the optional BAS PLUS, which can prevent an accident or reduce its severity, the passive measures that contribute to pedestrian safety have also been further improved in the 2012 M-Class. Active Park Assist and the reversing camera enhance both safety and convenience. The body design of this new-generation model, with the very typical shape of its C-pillar, is full of character and immediately recognizable as an M-Class. Its styling, high-quality appeal and excellent ease of operation combine to give it a forceful presence. The front of the vehicle is dominated by the powerfully self-confident design of the radiator grille with its centrally positioned Mercedes star, giving it that typical M-Class look. The new styling of the headlamps conveys a high-quality, exclusive and innovative impression. The LED daytime running lamps are set in chrome inserts integrated into the bumpers. A deeper, broad, chrome-effect skid plate continues down from the lower edge of the radiator grille, reinforcing the impressive overall appearance. Seen from the side, the elongated lines give formal emphasis to the on-road credentials of this vehicle, whose compact proportions are defined by a large wheelbase and short overhangs. The C-pillar that is so characteristic of this model series takes its cue from early generations of the M-Class and differentiates it very clearly in stylistic terms from its competitors. At the same time, the way the roof line slopes down to the rear underlines the sporty appeal of the new M-Class. No pillar is visible in the transition from the rear side window through to the rear windshield. This, together with the similarly wrap-around effect of the two-part taillights with LED fiber-optic technology, and the lowered roof with its large roof spoiler, add up to an overall seamless design. The rear bumper, which features an integrated chrome load sill guard in a new "wing design," defines the characteristic appearance of the SUV's rear end. The chrome finish of other product features, such as the roof rails, the beltline trim strip and the load compartment handle, emphasize the highquality appeal of the exterior. In the U.S., available wheels range from the standard 19” Twin-Spoke alloy wheel through to 20-inch wheels with an elegant, high-quality appeal. A look at the interior design immediately demonstrates the way the authentic SUV experience is combined with the sense of comfort inherent in a premium Mercedes-Benz sedan. While the expressive design of the center stack embodies the power of an SUV, the gentle downward curve of the dashboard on the front passenger side gives a sense of spaciousness, thus emphasizing the vehicle's comfort. The roomy and well-lit interior offers noticeably more elbow room than its predecessor (1.34 inches more in the front, .98 inches in the rear). An eye-catching feature of the instrument panel is large decorative wood trim that is continued along the doors in a seamless wrap-around effect. These generously proportioned trim elements, in a three-dimensional design, are available in four high-quality wood finishes, or in aluminum. The interior of the new Mercedes-Benz M-Class can thus be appointed to reflect either exclusive refinement or sporty sophistication, according to the customer's taste. The door handles and seat adjustment switches have been inset with precision craftsmanship into the side trim. The door center panels feature distinctive decorative stitching, with a separate, exclusive look for the optional Sports package. The state-of-the-art instrument cluster with its two clear and easy to read round dials and a large, 4.5 in display between them, impresses with the high-quality look of its design. Dominating the center of the dashboard is the large screen for the COMAND system. The control and display concept was developed specifically with user-friendly operation in mind. In the M-Class, Mercedes- Benz is introducing an advanced ergonomic concept that will find its way into all future new models. Just one element of this is the improved accessibility of the turn signal stalk on the steering column. All control levers can now be clearly seen. The cruise control lever has been moved to the lower position. Infotainment, navigation and communication systems are intuitive and easy to operate using the metal Central Controller located on the center console. Vertical rectangular air vents on either side of the large screen serve to emphasize the more functional aspects of the SUV. The outer air vents are the same shape but in this case horizontally positioned, thus giving added design flair. The center console incorporates an armrest with integrated handrest, in front of which is located the Central Controller and various switches. The seats in the 2012 M-Class are designed to provide a high level of comfort on long journeys as well as excellent lateral support. All important parameters can be electrically adjusted. These include the adjustment of seat height, backrest rake, seat cushion angle and reach. Generous seat adjustment travel of more than 13.75 inches lengthways and more than 3.5 inches in height ensure that M-Class drivers will always find the ideal seating position. A high level of variability characterizes the rear seats, which are fitted with an armrest and cupholder. The backrest angle adjustment on the rear seats is new, as is the optional through-loading feature above the armrest for the transport of skis. Folding both backrests as well as the seat cushions forward creates a level load compartment with a capacity of 71 cubic ft. up to the roof liner. Three colors are available for the interior appointments: black, almond beige and grey. In conjunction with the Sport Interior package, the combination of DINAMICA microfiber and black M-B TEX man-made leather, or premium leather and black two-tone leather is also available. The new M-Class comes standard with a new audio headunit with a 7-inch color display, Bluetooth audio streaming and telephony, phonebook download, 6-disc CD/DVD/MP3/ AM/FM /weatherband radio, HD Radio, album cover art, auxiliary input and USB port. As part of the optional Premium 1 package, customers receive hard-drive based navigation, SIRIUS traffic & weather, 3D city models, intermediate navigation destinations, and area avoidance.